When I read the DSAD daily auction list this morning, one name caught my attention: PHHH.com. The reason it caught my eye is because the PHH Corporation filed and won a UDRP complaint for the PHHH.com domain name in mid-2015. At some point in 2016, the Whois information for this domain name was made private. It looks like the domain name expired in January of this year. 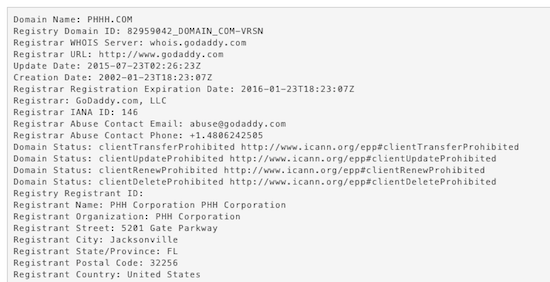 There is a message at the top of the PHHH.com landing page that says, “NOTICE: This domain name expired on 1/23/2017 and is pending renewal or deletion.” Because the domain name is registered at GoDaddy, it is now in auction at GoDaddy Auctions. As of the time of publication, the high bid is now $2,555 and there are 22 bids. There are just under 4 hours remaining in the auction. The category listing is “Expired – Expired” which I believe is the categorization for expired domain name auctions. As is the case with GoDaddy Auctions domain names, I believe the original registrant has a few days to renew the domain name before the winning bidder takes possession. It is surprising to see this domain name expire when it had been won in a UDRP proceeding.